Customers of Guts and Glory Tennis will experience the difference of quality, convenience and unrivaled stringing services fully supported by our goal of 100% customer satisfaction. Simply stated, if you are not delighted, we are not satisfied. We take great pride in developing a reputation for quality and providing the industry’s best customer service. If for any reason you are dissatisfied with a purchase, we will assist you with a prompt exchange or refund. Guts and Glory Tennis, LLC will take back items that are defective or that do not satisfy your expectations for 30 days from the invoice date and exchange them with a new product or credit toward a future purchase from us. Full refunds will be issued in the same form the purchase was made on any product returned in original packaging and still in new condition. Partial store credits will be given for products that are not defective, but have been removed from the original packaging. Shipping charges for exchanges or refunds where Guts and Glory Tennis, LLC is not at fault or the product is not defective, will be paid by the customer. All racquet vitalization services come with a pledge of unrivaled customer satisfaction. Your complete satisfaction is our goal, and we will do all in our power to reasonably reach this goal. We honestly aspire to provide you with the level professional service, and quality products that will overwhelm you with a deeply rooted sensation of complete satisfaction. If you are unsatisfied with our strings or racquet vitalization services for ANY reason, contact us immediately and we will work with you to make it right...that is our pledge to you! Guts and Glory Tennis permits customers to cancel orders within 24 hours after placing them. If an order you wish to cancel has already been shipped, you will need to return the item to Guts and Glory Tennis for a complete refund. We are not able to refund shipping charges incurred for returned items. Customers can also call us at 404-926-6060 and we will do our best to answer any questions you have related to the exchange/return process. Guts and Glory Tennis is fully committed to making sure you receive your order in a reliable, timely and affordable manner. Toward that end we offer several delivery options for our customers. When placing an order with us you can be assured it will be processed quickly and efficiently. Our goal is to get it shipped within a period of 24 hours or faster for you. Toward that end all orders received prior to 11:00AM EST (M - F) will be shipped the same day (except holidays and posted vacations). We will make efforts to ship orders received between 11:00AM - 5:00PM EST the same day, but can not guarantee same day shipment for orders received after 11:00AM. We a pleased to introduce $6.00 Flat Rate Ground Shipping charges for orders weighing less than 5 pounds shipped to a business address for the vast majority of our customers located in the continental USA. Pacific and Mountain states have a flat rate of $7.00 shipped to a business address. If you select this option we will ship to you using either FedEx Ground or USPS Priority Mail. We will choose the method that is the best blend of time and cost. Federal Express (FedEx) Ground Service is the option we recommend. FedEx Ground offers full tracking services as well as Saturday home delivery to our customers in the continental USA. We think the full tracking, guaranteed delivery date and reliability of this service makes it a solid choice. We have created a tiered pricing structure to reward customers who make larger orders by reducing shipping costs when this method is selected. (See rate chart below and note that shipping to your business address is still a better economic value). 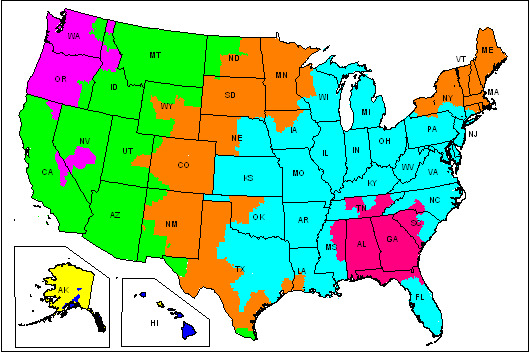 Delivery service times can be found in the attached service map. NOTE: FedEX Home delivery does not deliver on Sunday or Monday. Please factor this in when calculating delivery times. Please contact our customer service representatives at 404-926-6060, If Express Services are needed. We will work with you to determine your best and lowest cost shipping option through either Federal Express or the USPS. A dream of ours is to one day offer FREE Shipping to all of our customers. While the economic realities of our business do not allow us to offer that at this time we hope to get a volume that one day will make this a reality. Our shipping prices have been set according to pricing standards of specialty online internet shopping sites such as ours. If you believe your shipping charges are clearly out-of-line please give us a call and we will review them with you and, if appropriate, make adjustments. We want to earn your business with good value and fair pricing. Unlike some online retailers, shipping is NOT a profit center for us. In fact we do not quite make it to the break even point in terms of daily shipping charges vs. expenses. We process VERY FEW international orders. The only country we ship to outside of the USA is Canada. The products we ship abroad are limited to the MSV and WeissCANNON strings sets and reels. ALL INTERNATIONAL ORDERS TO CANADA WILL BE SHIPPED VIA A METHOD THAT INCLUDES TRACKING, INSURANCE AND DELIVERY CONFIRMATION. Usually we use USPS Priority Mail or USPS Express Mail. We ask our Canadian customers to initiate their orders with us our contact us page. Shipping charges will then be calculated and communicated with our Canadian friends. We will then send a Paypal request for payment and once the payment is received the order will be shipped. NOTE: All Canandian customers will be responsible for any import taxes applied by the country where the parcel is shipped or delivery fees assessed by the delivery service. Please do no ask us to undervalue the amount of the order on the shipping documents as that is one request that we can not accommodate. Guaranteed Accurate Orders: Order with complete confidence from us via our secure online "Mighty Merchant" shopping system or call us at 404-926-6060 to place your order with a live, friendly and eager to serve human being! Guts and Glory Tennis triple checks each order before it is shipped to make sure it is always accurately filled. If your order is incorrect, we will credit you with all original shipping costs, plus all shipping costs necessary to exchange or resend items to you. Same day shipping on all orders received prior to 11:00 a.m. EST. 24-hour shipping guaranteed, when same-day shipping is not possible. If for any reason your order is unable to be immediately fulfilled, you will be contacted via email explaining the delay and reviewing your options. You select your preferred shipping option. We ship using Priority Mail through the United States Postal Service as well as FEDEX Ground. Currently we only ship to customers in the continental United States. Our guarantees are designed to support our ongoing commitment to quality. Guts and Glory Tennis is clearly an industry leader in customer satisfaction. As yet another signal to our customers that we are in the upper echelon in terms of complete satisfaction, we’ve put our guarantees in writing. We hope you'll take a minute to read the following guarantees. With a clear understanding of them, we think you'll find Guts and Glory Tennis, LLC to be the obvious choice for your tennis needs. GUARANTEED FAIR PRICING: We plan to grow our business by focusing on the needs of our customers and we know that price can be one critical concern. We strive to eliminate this concern by assuring you that by choosing Guts and Glory Tennis, LLC you're getting low and competitive prices with superior service and individual attention. We routinely scan our competitors to assure that our prices are at the lower end of the price spectrum. If you find an item we carry at a lower price, let us know. Once the price is confirmed we will do our best to match or beat it for you. As should be expected, there are some common sense boundaries that apply. We must be able to verify the lower price. Lower prices that cannot be confirmed will not be honored. The source of the lower price must be practicing business in the metropolitan Atlanta area. We can not match prices on items that we do not carry. We may not be able tp match prices with any source that is going out of business or clearing out an item. GUARANTEED ACCURATE ORDERS: Your order will be filled accurately and timely. This service guarantees that the items shipped to you are exactly as they appear on your order. If the products, as entered into our order system, are not what's shipped to you, we'll promptly correct the problem and pay for all related postage, plus credit the cost of the original postage costs to your next order. Miscommunications, misunderstandings or data entry errors are not covered under this guarantee. We hope this guarantee will add to the enjoyment and ease of your Guts and Glory Tennis, LLC mail order experience! GUARANTEED CUSTOMER SATISFACTION: Your complete satisfaction is more than a goal, it is an obsession. If for ANY reason you are unsatisfied with a product or service we provide to you, please contact us immediately, (within 30 days or sooner please! ), so that we can work with you to make it right. If you are not happy, we literally do not sleep. Because we value and want to earn your complete satisfaction and repeat business, we will go the extra mile, whatever it is, to make sure you are completely satisfied with your purchase. STRING SATISFACTION GUARANTEE: One advantage of having a personal racquet care technician is the expertise and advice that can be offered in selecting a string to match your racquet and your game. If we make a recommendation and for any reason you are unhappy with the string we recommended, we will restring with your previous string, (if we carry it), at your previous tension. If the replacement string has a higher selling price than the string originally installed, you will only be charged for the difference. If the replacement string is the same cost or lesser, no additional charges will be applied. The Information We Collect: Guts and Glory Tennis collects from you the necessary information, such as name, email address, address and payment information, to process orders. We Do Not Share Your Personal Information: Guts and Glory Tennis does not sell, trade, or rent your personal information to others. This information is for our private records only. We restrict access to your orders to those employees who need to know that information to provide products or services to you. Personal information is not available to any third party via our website or through other means.